Martin Luther King, Jr. Day is celebrated the third Monday in January and is a federal holiday honoring the life and legacy of the American civil rights leader. This year, Martin Luther King, Jr. Day is on January 16. Dr. King encouraged America’s citizens to make the country a better place to live. He believed in non-violence and wanted to empower people to take action. 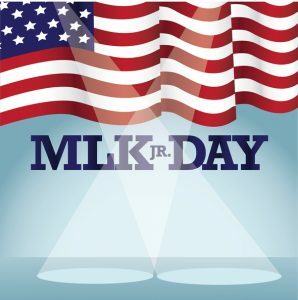 As a way to pay further homage to Dr. King and his beliefs, in 1994 Congress designated the Martin Luther King, Jr. Day holiday as a national day of service. It is considered “a day on, not a day off.” The day promotes volunteerism and is meant to inspire people to serve their neighbors and communities. Collect items for care packages that will be sent to veterans, first responders, new recruits, wounded heroes and their caregivers, and deployed U.S. service members. Get your family and friends together and help seniors in your neighborhood with yardwork, housework, shopping, or other tasks. Ask people to donate their old prescription eyeglasses. There are many organizations, such as Lions Club International, that will accept your collection and give them free of charge to people in need. The Lions Club’s Recycle for Sight program has collection boxes where you can drop off your donations, or you can send your donations by mail. Hold a food drive and collect non-perishable food items for a local food pantry, soup kitchen or homeless shelter. Contact them beforehand to see what items they accept and which are the most needed. Bring some homemade treats to your local fire or police station to show your gratitude for the services they provide every day. Help your furry friends and visit an animal shelter. Walk dogs, assist with cleaning cages, drop of donated food and towels, and more. If weather in your area permits, have a garage sale and donate the proceeds to a charity of your choice. Bonus – it’s a great way to declutter your home! Put together a team of volunteers and clean up a park, beach or other public area that could use some TLC.